We’re nearing the end of this 12-part series of the warning signs of toxic leadership that has, hopefully, provoked some reflection and caused you to look at yourself in a different light. Looking is a great start. Reflecting is important. But don’t stop there. Create a plan to work on whichever one(s) of these 12 blind spots has potential to derail you. Now that you know, you have the power to avoid stalling out in your career or negatively affecting your team. If the persona we’re presenting today describes you, getting started may be more challenging than it is for others. You may be unaccustomed to acknowledging the need to work on yourself, which includes receiving negative feedback. Don’t let that discomfort prevent you from doing something about it. Left unchecked, these issues only get worse. They can become the root of a bad reputation and even manifest as toxic in the workplace. 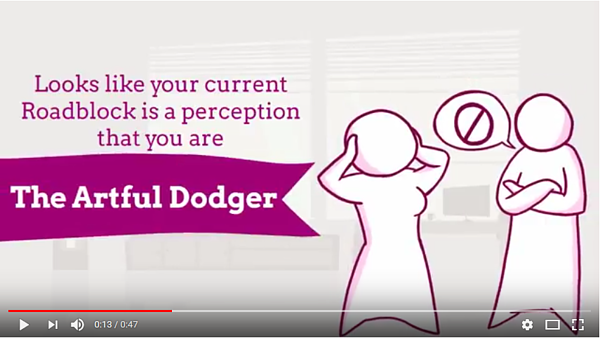 Warning Signs of Toxic Leadership: Are You The Artful Dodger? La la la la la la la la la la. I can’t hear you. And I don’t want to. If you don’t get feedback, you won’t have to deal with the sting of criticism. If you can externalize blame, you don’t have to accept responsibility or experience embarrassment or admit making a mistake. So, metaphorically, you keep your fingers in your ears and refuse any critique or feedback. You dodge and deflect and dance around anything that might suggest room for improvement. Or at least it looks that way to others. Denies, deflects and dodges responsibility or opportunities for improvement. Externalizes blame and refuses to acknowledge how you could have done things differently. Is defensive and unwilling to hear constructive feedback. Lashes out at those who attempt to give you constructive feedback. Cannot be vulnerable or humble enough to disclose personal limitations or growth areas. You wanted to minimize the amount of constructive criticism you received. It felt necessary to distance yourself from blame or the sting of criticism. You doubted the intentions of the person offering feedback to you. You were performing at such a high level that your areas of weakness were less important. You felt too fragile to accept or even consider the feedback being offered. Maybe this persona isn’t who you really are. It’s not who you intend to be. It feels unfair to be labeled this way. Nonetheless, if people see you as The Artful Dodger and believe you don't know how to take criticism at work, something caused them to see you this way. For them, this is real. What Can I Do if I Hate Receiving Negative Feedback? If you are, indeed, The Artful Dodger, here are some immediate actions you can take to change others’ perceptions and exhibit these behaviors less frequently. View others’ feedback as helpful or instructive, intended to support your growth. Remember that it’s not easy for others to offer feedback. They do it because they care. Hear and process feedback before responding to it. You may find some useful insights when you practice receiving feedback effectively. Model what inviting and graciously responding to negative feedback looks like. Then others can hear yours, too. If you’re wondering whether or not it’s worth it to make these changes, you should know that there is an impact to being perceived as The Artful Dodger. There’s an impact on people you work with. The biggest risk you take when you allow Artful Dodger behaviors to go unchecked is that people will give up on you. If they’ve tried to help and you denied or dismissed the need for help, they will stop trying. If you seemed defensive and counter-attacked, they may avoid you entirely. By not acknowledging your own areas for improvement or not taking responsibility for the mistakes you’ve made, you’re holding others to a higher standard than you are willing to meet yourself. At least that’s how it appears to others. 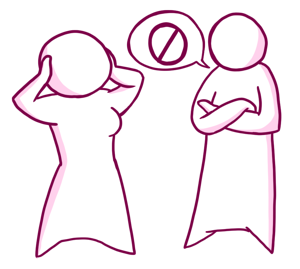 Your unwillingness to hear their feedback makes them unable to hear yours. You also run the risk of appearing arrogant. As you work to mask your skills gaps or deflect criticism, it could be inadvertently signaling that you think there’s no need to grow, improve or change. The Artful Dodger, and failure to learn how to handle criticism, is one of 12 behavior sets that can become career roadblocks. When others are observing the issues with someone who is stuck and has these blind spots, they frequently use terms to describe these roadblocks (e.g. “control freak” or “dinosaur”).